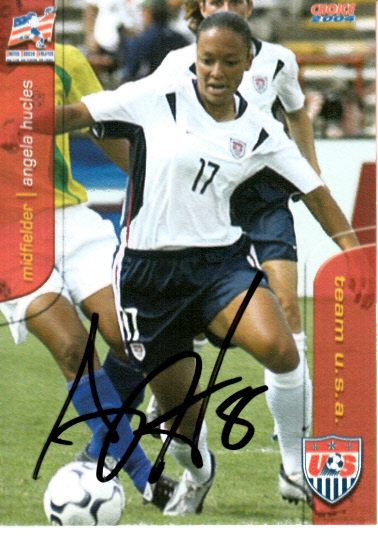 2004 U.S. Soccer card like element (cut from a poster featuring the entire card set; printed on paper stock with blank back) autographed in black marker by former U.S. Women's National Team star midfielder Angela Hucles, a key member of the 2008 Olympic gold medal winning team. ONLY ONE AVAILABLE FOR SALE. With certificate of authenticity from AutographsForSale.com.